I'm eager to get some paint on the rest of the new warband, but in the meantime they've already bloodied their talons on the 28mm battlefield in a few skirmishes. Their play style is very different to the Silvermoon Syndicate that I'm used to, but I'm enjoying the change of pace. 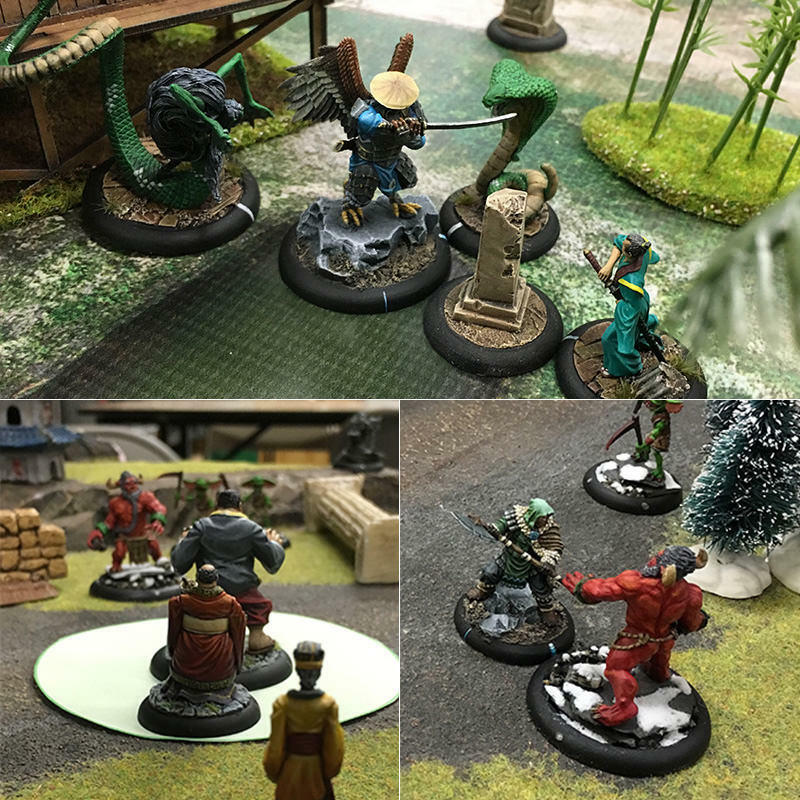 The extra mobility that their flight provides means looking at the table in a very different way - terrain and other miniatures no longer block the way. Add to that Kotenbo's "Command" trait and Tarobo's ability to Dash out of combat while dropping stun markers in his wake and I've had some fun battles. That's not to say that the Syndicate have been forgotten. They've also seen a few battles lately. Actually, it's only recently that I've had the opportunity to field a full 50 rice warband. For me, that's the starter set plus Fitiaumua and Old Zo. Having both Harukichi and Old Zo has been a bit risky as that's a fair number of points sunk into purely support characters (if either of them wind up in melee, things aren't going well for me!). However, I've learned that nobody like being on the receiving end of Old Zo's "Tax" aura! I finished painting my steampunk Ariel (by Guild of Harmony) way back in July. 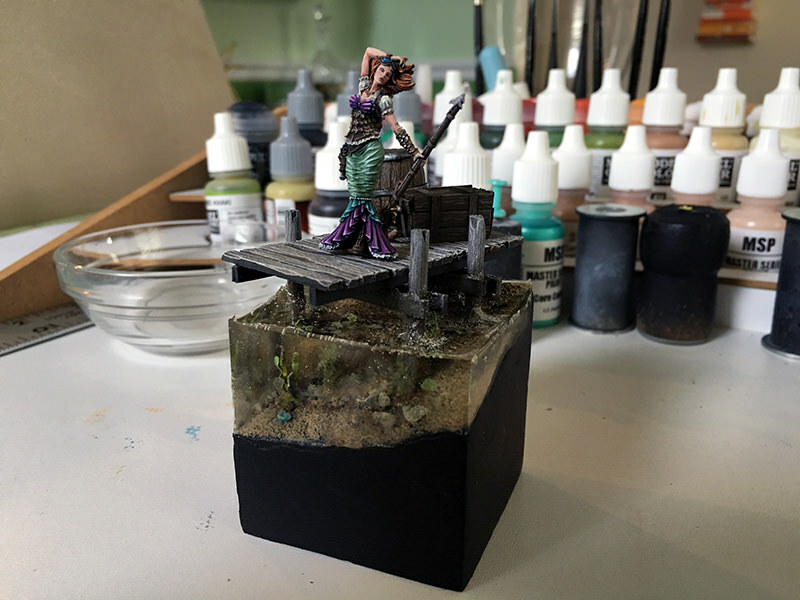 The big plan for her was to create a water base with her standing on a wooden dock jutting out over the water. While I'm really comfortable picking up a brush and jumping in to painting, my modeling chops are a bit further behind. It can take me forever to create a small base that I'm happy with... well, maybe not "forever", but in Ariel's case: 4 months. 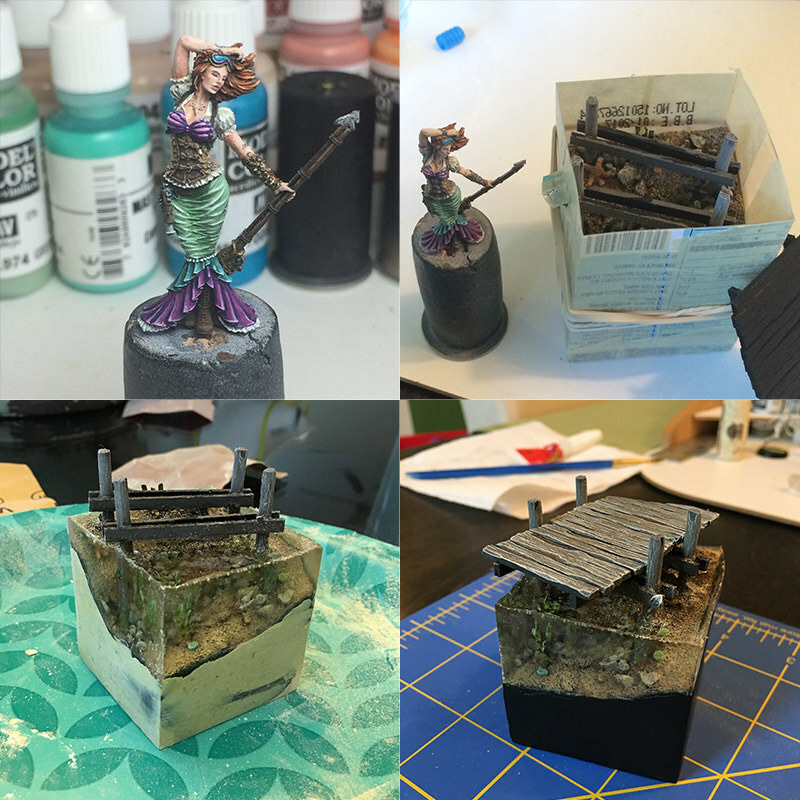 After carving out a wooden cube for her base, building a dock, adding sand, seaweed, etc. and painting it all, I poured in the "water" with Liquitex. Unfortunately, I didn't quite get it sealed in exactly as I wanted and this left me with the wooden part of the base very uneven with "rivers" of water all over. I had expected the Liquitex to set hard, but even after days (weeks by now) that's not quite the case and it's all a bit rubbery. This lead to some problem solving and after a couple of false starts, I was eventually able to fill in the gaps and create a new surface to the wooden cube with Milliput. Not wanting to accidentally ruin anything, I abandoned my idea for creating waves and splashes on the water surface as I was unsure how to handle the rubbery Liquitex. On top of the dock, I created a barrel, crate and anchor to provide some additional "set dressing". I'll try to post a quick "how to" post on creating a barrel. I'd previously created one for my 54mm minstrel (another mini from a year ago that I'll have to post here) but this was the first 28mm one I'd built. They're actually dead simple, they just take a little time to get right. I need to glue all the pieces down and would like to add a bit of rope to finish things off, but I'm quite pleased to see this piece almost finished. Even without the waves on the water's surface, I'm still pretty pleased with my first try at a water base. After wrestling with Ariel's base for so long, I really want to just jump back into painting a few minis without needing to worry about basing or constructing anything. However, along with the Tengu, I also received the Enigma Miniatures Sumothay Warrior for my birthday. He's a great looking mini, but will naturally need something to stand upon so I may need to do just a little more before I can get back to simple painting. 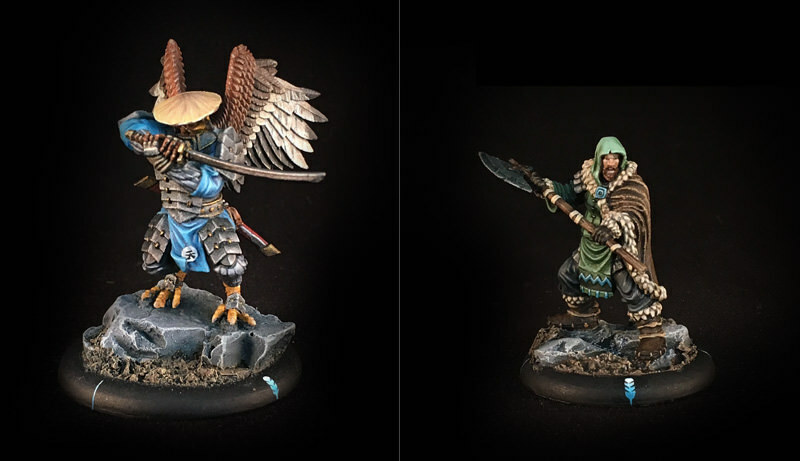 Then (or possible at the same time) I've got some more Tengu that need some paint so they don't feel quite so plain on the table next to Kotenbo and Taliriktug. Finally, I hope to not leave this blog quite as unattended as it has been the past few weeks!